After nearly a year of nourishment and care by Woodland Park Zoo turtle experts, 53 endangered western pond turtles swam their way back into the wild when we joined Washington Department of Fish and Wildlife to release the turtles last week at wildlife refuge sites in Pierce and Mason Counties. 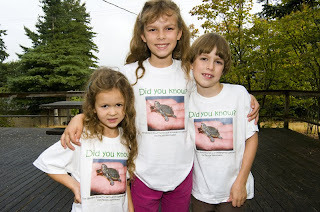 On hand to help release the shelled reptiles was 7-year-old Harrison Keyser of Sammamish, Wash. (pictured at left with his sisters) who arranged a “Turtle Trot” to raise more than $300 for the Western Pond Turtle Recovery Project. Harrison told us he thought “it was really cool letting the turtles go in the pond” and he’d like to do this again next year. We’d be happy to have you back, Harrison! Once common from Baja, Calif. to Puget Sound, including the Columbia River Gorge, the turtles were virtually extirpated due to loss of habitat, disease, and predation by non-native species such as bullfrogs and large-mouth bass. They were on the verge of extinction in Washington in 1990, with only a mere 150 turtles left in the wild. The state listed western pond turtles as endangered in 1993. 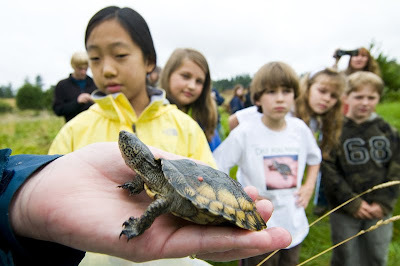 But the good news is, the Western Pond Turtle Recovery Project has helped boost the population of the species to about 1,500 in Washington state!